Through this newsletter I would like to introduce my good friend Mr. Venkat Kothur. He is a dedicated volunteer of Hindu Mandir for many years. Currently he is leading the Food Committee and makes sure that each weekend (Saturdays and Sundays) there are sponsors/volunteers to provide lunch to devotees and visitors of the temple. He was instrumental for the success of large events like Kumbhabhishekam in 2006, RGM in 2009. He and his team of devoted volunteers arranged 9,500 meals during 3 day ceremonies of Kumbhabhishekam in 2006 and another 5000 meals in 2009 RGM event. His team generated considerable amount of revenue in 2009 through food sales. He is also instrumental in implementing web based sign-up process. Venkat Kothur and other volunteers of the temple raised also about $106,000 in 24 hours during one day matching donation campaign through 'GiveMN - Max Day Donation'. He is also well known figure in Telugu Community. 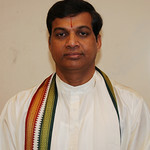 He served as President, Chairman and Board of Director in Telugu Association of Minnesota (TEAM) and continue to participate as a volunteer in their activities. He loves Telugu literature and music. He enjoys writing Telugu poems/songs and loves singing too. He is an IT engineer by profession and lives in Rosemount, MN with his wife Neelima and two daughters. He says it is very gratifying to serve the almighty God and the community and he made many friends, met many intellectuals and had many valuable learning experiences. He loves to be part of this fabulous community and wonderful temple of our own. I am Venkat Kothur. I am serving as Chairman, Food Committee at Hindu Temple, Maple Grove, MN. My commitment to the temple food services are: "Annam Para Brahma Swaroopam - Athithi Devobhava - Anna Daata Sukhibhava " Our sacred scriptures show us a path for every walk of life. We believe in these sayings and try to follow them with true spirit to the best of our ability. We strive to provide un-interrupted "Naivedyam" as 'Annam parabrahma Swaroopam' to deities while serving devotees with prasadam and delicious food. Atithi Devobhava: My service goes directly to every visitor to the temple. Every devotee is treated with utmost respect as " Atithi deva" a revered guest, and offered services with hospitality. We put forth our best efforts to make the devotee experience at temple, a memorable one. Anna Daata Sukhibhava: A dedicated volunteer base, sponsoring food/prasadam, serving devotees, is the lifeline for our food services. It is the devotion and commitments of our Annadatas and Annapurnas makes the Food Sponsoring, one of the most gratifying services at our temple. Providing prasadam and sumptuous food enable our devotees and guests to spend more quality time at temple, performing pooja, attending kids activity or just enjoying the blissful moment at HIS presence. We do our best to accomplish this by providing variety of prasadam/food to our diverse community, with the help of our dedicated volunteers and priest/cook. Apart form regular devotees we serve many more other visitors, as our temple offers social, religious and educational gatherings on regular basis. We are glad to see the results of process improvement initiatives we started a while ago and positive response from community at large. The on-line registration and communication process is one of the key aspects. This enables easy access to food sponsors to check, verify and pick a date to serve at their convenience. Plese visit our Food Services website while you are there, become an 'Annadata'! Message to Devotees: Dear devotees and Annadatas, thanks a million for your marvelous support and dedication in serving the temple and community. You planted the seeds.. keep watering.. watch it grow !!! Thaipoosam a Hindu festival celebrated on the full moon in the Tamil month of Thai (Jan/Feb). The festival commemorates both the birthday of Murugan (also Subramanian), the youngest son of god Shiva and his wife Parvati, and the occasion when Parvati gave Murugan a vel (spear) so he could vanquish the evil demon Soorapadman. 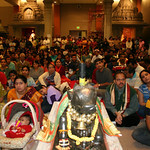 On 1/29/10 evening, our tamil devotees celebrated Thaipoosam with pomp and flair. Over 50 families participated in the function where the priests performed the wedding celebration of Subramanya Swamy amidst the chanting of the mantras and the singing of devotees. A group of children performed a skit highlighing how Lord Subramaniyan landed from Mount Kailash to southern mountains of Palani (in Tamil Nadu) where he took abode and became the famous God, known by many names like Karthikeyan, Skanda and Murugan. Songs were sung honoring Subramaniya Smamy, by Veena, Nirmala, and the students of Vidyapeetam Indian Cultural School. The program ended with a sumptous dinner and it was yet another wonderful evening at the temple for devotees who, though far from our home country, are enjoying the same rich traditions at our Hindu Mandir. Click here to veiw Thaipusam event video. The festival of Mahashivaratri falls on the 14th day of the dark fortnight in the month of Phalgun. It marks the night when Lord Shiva performed the Aananda Tandavam. It is also believed that Lord Shiva and Goddess Parvathi were married on this auspicious day. Mahashivarathir was celebrated with great devotion at our temple on Friday February 12th. Throughout the day devotees performed abishekam to Lord Shiva. Abhishekam to the moolavar was performed in the evening. Rudram chanting, abishekam, archanas and bhajans marked the celebration that was attended by more than 700 people. The Hindu Mandir once again opened its doors to another successful gala event to celebrate the fun Indian spring festival of colors, Holi. 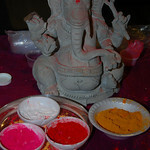 Holi is celebrated at the end of the winter season on the last full moon day of the lunar month Phalguna (February / March), (Phalgun Purnima), which usually falls in the later part of February or March. This year Holi is on February 28 and Holika Dahan was on February 27. At our Mandir, we celebrated the evening, indoors, with sumptuous food and a cultural show that had various local talented desis performing with gusto. We have several volunteers who prepared delicious Indian eateries, people gathered with friends and family and enjoyed a fun time together before walking around the bazaar which had quite a nice collection of Indian garments and jewelry. Many also had put up information booths regarding the many activities or organizations within the twin cities area. Our President, who was afflicted with laryngitis, had a speaker to read her thoughts, which was thoughtfully written out thanking the many people, who steadily help the Mandhir grow day by day. Nevertheless there is still lot more to do and more generosity from our own is needed to sustain and grow the temple further. She made sure to acknowledge the fact that everyone whose steps into the mandir is a valued friend and devotee. The fun evening culminated with a free for all dance session open to all who came and that was best way to end the evening - a few calories lost after an evening of good food and pleasant memories. Sages & Seers - About Saint Eknath. Eknath (1533-1599) was a prominent Marathi religious poet in the Hindu tradition in India. He was born in Paithan on the 6th day of the second fortnight of the month of Phalgun. That day falls this year on Friday March 5th, 2010.. He lived most of his life in Paithan in Maharashtra, India. In accord with a tradition in India of assigning the epithet "sant" to persons regarded as thoroughly saintly, Eknath is commonly known in Maharashtra as Sant Eknath. Eknath was well-versed in Sanskrit, Arabic, Persian, Urdu and Hindi languages besides Marathi. His parents were Suryanarayana & Rukmini who died when he was very young. He was brought up by his grandparents. By the time he was barely twelve years old he had mastered the Vedas and had studied Ramayan & Mahabharat thoroughly. Eknath became the disciple of Sri Janardana Swami - a highly ranked minister in the kingdom of Devgarh after Lord Shiva instructed him in his dreams to seek him out for guidance and instructions. Sant Eknath then surrendered his life at the lotus feet of his Gurudev since that young age and brilliantly carried out variety of tasks that his Guru handed out to him with an attitude of intense devotion. Through his Guru he received a personal Darshan and blessings from Lord Dattatreya. Following that encounter with Lord Dattatreya, Janardan Swami guided Eknath to the state of spiritual enlightenment through the process of intense meditation..
After that at the suggestion of his Guru, he led the life of a householder. Age 25 he married Girijabai, and the couple had three children. In his adult life, Eknath gave many lucid religious public discourses. He was severely criticized by the orthodox Brahmins for teaching general public the invaluable teaching of Upanishads in Marathi instead of Sanskrit. He insisted on teaching in the language that the common man spoke just the way Sant Dnyaneshwar did before him. In addition he raised his voice against untouchability and decried social inequality based on caste and creed. He believed in the universal brotherhood of man and advocated devotion as a pathway to the realization of God. Eknath initiated in Maharashtra a movement called Wasudewa Sanstha. It involves house-to-house visitations by individuals known as Wasudewa, who, standing in front of people's houses, spread religious messages through bhajan chants. For the benefit of the devotees all his literary work is described below. Almost all of Eknath's writings were in verse form in Marathi. His very first composition was a commentary of four verses from Bhagwat named Chatushloki Bhagwat in Marathi. That composition consisted of 1036 owees (A special kind of Marathi Lyrical Composition). 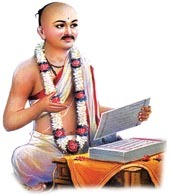 Eknath also wrote a scholarly and lucid commentary, Eknathi Bhagawat, on the Eleventh Canto of Sanskrit Bhagawat Purana. The commentary involved 18,800 owees. 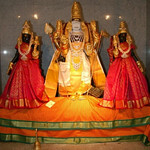 He worte the first 25,000 owees of his another major work, Bhawartha-Ramayana. A disciple of his later added 15,000 owees to complete this work. Perhaps his greatest literary contribution was to restore the monumental work of Sant Dnyaneshwar 230 years earlier, the "Bhavartha-Deepika" a classic commentary on Bhadwadgita to create the commonly used "Dnyaneshwari." This email was sent to haritha.chimata@gmail.com by webmaster@hindumandirmn.org.